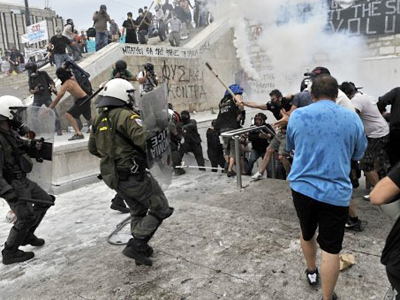 The Greek parliament has passed a second austerity law which will last until 2015. In the meantime protesters have started gathering in the heart of Athens ready to demonstrate over the parliament’s decision. Financial journalist Demetri Kofinas, who is in Athens, told RT the Greeks have started massing quickly in front of the parliament building in the city center. The protesters planned to gather at 6 pm local time, but it took them another hour to take to the streets. The protests are expected to break up soon as the parliament passed an austerity law by a majority vote earlier on Thursday. Kofinas believes what is going on in Greece now is a real example of democracy. On Wednesday, 155 of Greece’s lawmakers voted in favor of a new round of austerity cuts, with 138 against, thus securing the next multi-billion-euro installment of cash from the EU and staving off a default. European officials welcomed the move. 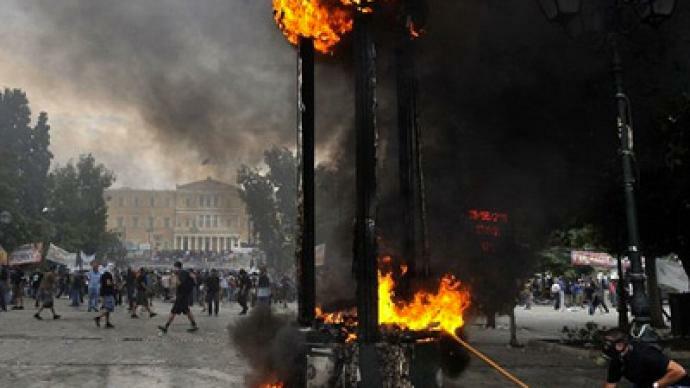 However, Greeks could not have been less happy with the pending austerity measures, as they gathered in the center of Athens on the second day of a general strike. Furious demonstrators reacted violently to the vote, with police and protesters engaged in running battles, which left some 200 people injured. As the voices of discontent grow ever louder, analysts are dubbing the EU bailout of Greece “robbery and swindle”, saying the people will not get a penny from the next installment. As the vote took place, stun grenades echoed across the square outside the parliament building and clouds of tear gas hung over the nearby streets. The violence continued sporadically after the vote. Authorities and emergency services said 26 police and 15 protesters were transferred to hospitals, while 29 people were detained, and nine arrested, according to the Associated Press. “A common citizen had his salary reduced by about 40 per cent, most of the money is paid to the banks, and the austerity measures are really very hard. 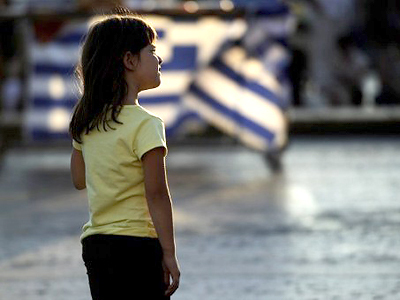 Since January nearly two billion euros a month are being transferred to banks outside Greece”. 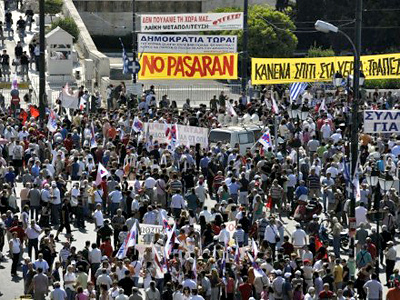 Stavroulakis maintained that people are risking their jobs in the country. 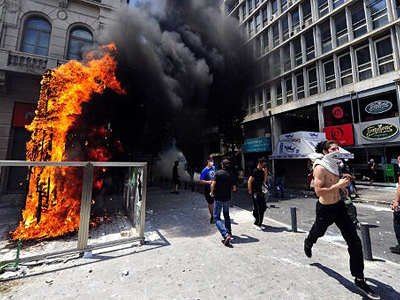 “Today unemployment rate in Greece reaches 17 per cent. The EU promises however the unemployment rate will be 15 per cent in 12 months,” he said. 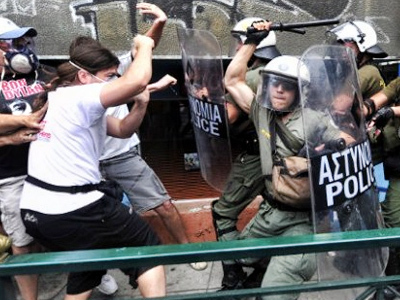 ­Activist Kiriakos Tobras told RT the atmosphere in Athens is extremely tense. “People are now really angry after what happened yesterday. It was a real horror – the police fighting against citizens and taxpayers, kicking kids and women, throwing tear-gas into shops. The more the policemen do, the more they will receive back in the form of protests,” said Tobras.